The Collingwood Football Club, nicknamed the Magpies or colloquially the Pies, is a professional Australian rules football club playing in the Australian Football League (AFL). Formed in 1892 in the then-working class Melbourne suburb of Collingwood, the club played in the Victorian Football Association (VFA) before joining seven other teams in 1896 to found the breakaway Victorian Football League (now the national AFL). Originally based at Victoria Park, Collingwood now plays its home games at the Melbourne Cricket Ground with its training and administrative headquarters located at Olympic Park Oval and the Holden Centre. Collingwood has played in a record 44 VFL/AFL Grand Finals (including rematches), winning 15, drawing two and losing 27 (also a record). Collingwood also won VFL/AFL record four premierships in a row between 1927 and 1930. Collingwood is regarded as one of Australia's most popular sports clubs, attracting the highest attendance figures and television ratings of any professional team in the nation. In 2013, it became the first AFL club to reach 80,000 members. Collingwood's iconic home guernsey consists of black and white stripes, matching the colours of an Australian magpie. Throughout its history, the club has developed rivalries with cross-town Melbourne based clubs Carlton, Richmond and Essendon. More recently, the club developed a rivalry with the Brisbane Lions, based in Queensland. Collingwood fields a reserves team in the Victorian Football League (formerly the VFA) and a women's side in the AFL Women's competition. It also owns and operates a netball team in the National Netball League. The Collingwood Football Club was established on 12 February 1892. Collingwood played its first game in the Victorian Football Association (VFA) against Carlton on 7 May 1892. The club won the VFA Premiership in 1896. In 1897, Collingwood, along with fellow VFA clubs Fitzroy, Melbourne, St Kilda, Carlton, Essendon, South Melbourne and Geelong split from the VFA and formed the Victorian Football League (VFL). Collingwood won its first premiership in 1902, defeating Essendon by 33 points. In the 1950s, rival club Melbourne enjoyed an era of unprecedented success, winning five premierships in six years (the last coming in 1960, and having been runner up in 1954). Collingwood lost two Grand Finals to Melbourne in this decade, but bounced back to win premierships in 1953 and 1958. Collingwood's 1958 premiership is much cherished by the club as it prevented Melbourne from equalling Collingwood's record four premierships in a row. The 1958 premiership was however to be Collingwood's last for 32 years, as the club was to suffer a string of Grand Final defeats in coming decades. A string of eight Grand Final losses, often by narrow margins, between 1960 and 1981 gave rise to a perception that the club was prone to "choking", a phenomenon wittily dubbed "Colliwobbles". Whether this perception is accurate remains a subject of debate; however, the club's record in recent years has been much improved, having won two and drawn one of its last six Grand Finals. Lou Richards ceremoniously buried the Colliwobbles at Victoria Park after the club's 1990 premiership. The 1990 premiership team, coached by Leigh Matthews and captained by Tony Shaw, had a one-sided grand final win against Essendon, the Magpies recording a 48-point victory and ending a 32-year premiership drought which included eight grand final losses and one draw. After this, however, the club lapsed into a state of decline. The club ultimately received a second wooden spoon in 1999. Within a few years, with a change of coach, playing list and club president, Collingwood reached and lost consecutive grand finals in 2002 and 2003, both to the Brisbane Lions. Following those Grand Final losses, Collingwood struggled for the next two years, finishing 13th in 2004 and second-last in 2005; the latter meant Collingwood was eligible for a priority pick which the club used to recruit Dale Thomas. Collingwood made a return to the finals in 2006, finishing fifth, but were defeated by the Western Bulldogs by 41 points in its elimination final. A loss to Essendon late in the season was to cost them the double chance. The 2007 season saw them finish sixth on the ladder at season's conclusion, and in the finals they knocked out the grand finalists of the past two years, Sydney, in the elimination final and then West Coast in overtime at Subiaco Oval in the semi-final. Having earned a preliminary final against Geelong, Collingwood lost to the eventual premiers, by five points. Nathan Buckley would announce his retirement at season's end after playing just five games in 2007 due to injury. Collingwood finished eighth in 2008 and were assigned an away final against Adelaide at AAMI Stadium. After at one point trailing in the match, Collingwood went on to end Adelaide's season and earn a semi-final meeting against St Kilda. Having defeated the Saints in both their regular season meetings, Collingwood lost convincingly, ending their 2008 season. The 2009 season saw Collingwood finish inside the top-four for the first time since 2003, but in the qualifying final were beaten by minor premiers St Kilda convincingly. Having won a second chance, Collingwood struggled against Adelaide for the second year in a row before John Anthony kicked the match-winning goal with a minute left to send them into another preliminary final meeting with Geelong. But the season ended abruptly for the Magpies, with a 73-point loss to Geelong. In 2010, Collingwood finished as minor premiers, and after wins in the qualifying and preliminary finals, reached the first Grand Final against St Kilda. The match finished as a draw, forcing the first grand final replay in 33 years. Collingwood won the replay by 56 points. The club won a second consecutive minor premiership in 2011, and qualified for the Grand Final after a three-point victory against Hawthorn in the preliminary final. However, Collingwood was then beaten by Geelong by 38 points in the decider, after trailing by seven points at three-quarter time. Following the Grand Final loss, which also marked the end of the club's 2011 AFL season, then coach Mick Malthouse left Collingwood after deciding not to stay on as "director of coaching". Star midfielder Dane Swan won the 2011 Brownlow medal with a then record 34 votes. In 2012, Collingwood once again finished in the top-four but in their first final they were convincingly defeated by Hawthorn forcing them to play in the next week against West Coast, winning by 13 points. The next week they were beaten by eventual premiers Sydney at ANZ Stadium, the first time the Swans had defeated the Magpies since 2005. The 2013 season was a mixed one for Collingwood, losing to Gold Coast and suffering a fifth consecutive loss to Hawthorn in Round 21, before being knocked out of the finals series by Port Adelaide at the MCG in the first week. Coach Nathan Buckley delisted several high-profile older players at the end of the season, including Alan Didak, Darren Jolly and Heath Shaw. Over the next two seasons, Collingwood would start the years with win-loss records of 8–3, but finished those seasons poorly and missed the finals. 2014 was the first season since 2005 where they did not make finals. 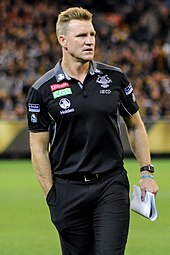 In both 2016 and 2017, Collingwood missed the finals again, though extended the contract of senior men's coach Nathan Buckley an additional two years. In 2017, the club made significant on-field and administrative changes, creating a senior women's football team and senior women's netball team in the AFL Women's and National Netball League respectively, as well as revealing a new club logo for the first time in many years. In 2018 Collingwood made the finals for the first time since 2013, finishing in third place behind West Coast and Richmond. Losing the Second Qualifying Final to West Coast, they went on to beat GWS and the reigning and minor premiers Richmond to reach the 2018 Grand Final, where they were defeated 79-74 by the West Coast Eagles. Collingwood scored 5 goals in the first quarter of each of the preliminary and grand finals. They held a 31-2 lead in the Grand Final. Throughout the club's history, Collingwood has worn a guernsey of black and white vertical stripes. The all white jumper, with the three black vertical stripes is the iconic strip that the club is most associated with. The current incarnation of the guernsey is mostly black, with white stripes on the front and lower half of the back, and white numbers. The main clash guernsey is the reverse of this: mostly white, with black stripes and black numbers, worn in away matches against clubs with a predominantly dark guernsey such as Fremantle Football Club and Port Adelaide Football Club. A secondary clash guernsey was introduced in 2011 and is used only in matches against North Melbourne due to similarity between the two uniforms. The alternate uniform is black with only two white stripes on each side instead of three. Traditionally, Collingwood has worn a white guernsey with black stripes. The club switched to the black guernsey with white stripes in 2001. "Good Old Collingwood Forever" is the team song of the Collingwood Football Club. The lyrics were written by player Tom Nelson during Collingwood's 1906 tour of Tasmania, making it the oldest of the team songs currently used in the AFL. It is sung to the tune of "Goodbye, Dolly Gray", originally a song written in connection with the Spanish–American War, then a popular Boer War and First World War anthem. It is the only AFL team song to reference the barracker, an Australian rules football term for fan. Carlton is considered to be the club's most bitter arch-rival (for full details see Carlton–Collingwood AFL rivalry), with Richmond, Essendon and more recently Brisbane close behind. 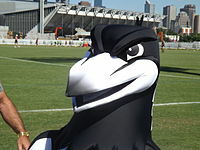 Collingwood's two opponents in the themed Rivalry Rounds staged to date have been Carlton (2005–2006, 2009) and Richmond (2007–2008). The first signs of a Collingwood/Brisbane rivalry originated in 1999, when Brisbane comprehensively beat the Magpies in the last ever AFL match at Victoria Park. In Round 8 2002 Collingwood beat Brisbane by three points in a tense match in front of 46,279 people at Colonial Stadium. This victory over the reigning premier took the Magpies to equal top of the league table (2nd on percentage) with Brisbane. The rivalry grew with the 2002 Grand Final when Brisbane beat Collingwood by nine points. The rivalry grew again in 2003 when the two clubs clashed on four occasions. The Lions defeated the Magpies at The Gabba in Round 4 before thrashing them in Heritage Round — Round 19 at the MCG. Collingwood then defeated Brisbane in the Qualifying Final with Alan Didak ensuring victory late in the final quarter, with two goals from the boundary line. The rivalry peaked in the 2003 Grand Final with Brisbane easily defeating Collingwood to win the premiership. The rivalry cooled off to a degree in the period following Brisbane's loss in the 2004 Grand Final due a sustained period of success at Collingwood and a string of poor seasons at Brisbane, however Dayne Beams recent defection to the Lions has seemingly reignited the rivalry. Despite Brisbane's string of poor seasons, the rivalry remains ignited due to many Collingwood supporters remaining bitter about the two grand final losses and the fact that the Brisbane Lions will forever be the last team to win a VFL/AFL match at Victoria Park. The rivalry between Collingwood and Melbourne was at its peak between 1955 and 1964, when the two played off in the grand final on five occasions. This included the 1958 Grand Final where Collingwood's victory prevented Melbourne from equalling Collingwood's record of four premierships in succession (1927–1930). The old rivalry with Melbourne has faded in recent decades due to Melbourne not enjoyed the same level of on-field success, however, it remains strong and is an annual scheduled fixture on the Queens Birthday public holiday. Collingwood's rivalry with Essendon has become more significant since 1995, when the first ANZAC Day clash took place. After the 2018 match, Collingwood have won this contest 14 times and Essendon 9 times, with the first match being drawn. The rivalry with Port Adelaide stems from them being known as the Magpies in their local SANFL competition before switching to the Power when entering the League in 1997. Feelings were heightened when Port midfielder Kane Cornes 'flipped the bird' at Nick Davis following the Power's five-point victory over the Magpies at AAMI Stadium in Round 9, 2002, only moments after Anthony Rocca had missed the opportunity to tie the scores. Jarrod Molloy and Brodie Holland remonstrated with Cornes after the match, with a feeling of hostility lingering after the two sides had left the field. Collingwood unexpectedly beat the Power in the Qualifying Final that season, also at AAMI stadium. Collingwood again defeated Port Adelaide in the 2003 Preliminary Final at the MCG. This added to the ‘choking’ phenomenon directed at the Power. The off-field battle over Port's desire to wear its black and white "prison bar" guernsey has been a major talking point, especially between 2002 and 2007, which added to the rivalry. A resolution was reached in favour of Collingwood. Games between Collingwood and Geelong have become highly anticipated since 2007. In Round 15 Geelong beat Collingwood by 16 points in a high-quality match. In the Preliminary final Collingwood surprised many when they came within 5 points of the eventual premiers. In 2008 Collingwood thrashed Geelong by 86 points—20.14 (134)- 7.6 (48) causing Geelong's only loss of the year. In 2009, the sides again met in the preliminary final, but despite high hopes the Cats, who would again win the premiership, won by 73 points in front of another massive crowd of 87,258. In 2010, the two sides emerged as the favourites for the flag and twice met in front of blockbuster crowds at the MCG when they were placed 1st and 2nd on the ladder—with the results evenly split. They again met in a Preliminary final, this time a resounding win to Collingwood by 41 points. In 2011, both teams were undefeated going into their round eight 'blockbuster' at the 'G. Geelong won by three points, after a controversial advantage was not paid to Magpie Scott Pendlebury in the dying minutes. Pendlebury kicked a goal and would have put the Pies in front, but the free kick was contentiously called back and Geelong managed to whisk the ball away. In the round 24 match, Geelong thumped the Magpies by a record margin of 96 points, which was also Collingwood's biggest ever loss at the MCG. The 2011 Grand Final against the Cats concluded with a 38-point loss for the Pies. Collingwood is a working-class suburb and the Collingwood Football Club supporter base traditionally came from the working class (though its supporter base today goes far beyond). Many of the club's supporters who regularly attend games still come from the working class or from lower socio-economic groups, leading to jokes from supporters of other clubs which typically stereotype their Collingwood counterparts as poor, crude and ignorant. Collingwood is traditionally reviled by non-Collingwood supporters ("You either love 'em or you hate 'em"). The dislike of the club by outsiders is said to have originated during the 1920s and 1930s, a period of great success for the club which drew the envy and resentment of other clubs. In this period, Collingwood was also perceived as a Catholic and Irish club, at a time when these groups were looked down upon by the rest of Australian society and subjected to a considerable degree of social exclusion. Until recent years, racial vilification of opposition players in VFL/AFL games was not uncommon. According to a 2001 study, Collingwood's old home ground of Victoria Park had a reputation as one of the worst venues for such vilification, though it has also been said that the problem was similar at all grounds. Collingwood has however been involved in several high-profile incidents of this type, such as those involving indigenous players Nicky Winmar in 1993 and Adam Goodes in 2013. Michael Long's accusation of racial vilification against Collingwood ruckman Damian Monkhorst in 1995 also led directly to the establishment of the AFL's racial vilification regulations. Collingwood club president Eddie McGuire has been credited for taking a stand against racial vilification by club supporters and for harshly dealing with offenders. In 2011 Collingwood reached 70,000 members for the first time creating a new AFL record, beating the previous AFL record of 58,249 set by Collingwood in 2010,. The club's membership base leads to large crowd pulling power which has caused the AFL to be accused of favouring Collingwood when scheduling to maximise the league's attendance figures. However the AFL states that this is due to other clubs requesting home games at the MCG against Collingwood. Collingwood was one of the last clubs to abandon its traditional stadium, the famous inner-city Victoria Park. Collingwood now plays home games at the MCG. It now also has its headquarters situated in the former Glasshouse Entertainment Centre. Due to a sponsorship deal, this facility is known as 'The Holden Centre'. Collingwood continues to be financially viable through the loyal support of its huge following and numerous sponsors. After finishing 2nd in 2002 and 2003 the team fell to 13th and 15th (out of 16) in 2004 and 2005 respectively. This trend has plagued the club since the glory days of pre-World War II VFL football. Since 1958, the club has won only two VFL/AFL Premiership (the inaugural AFL Premiership in 1990, and in 2010). Despite this, the club still has won more individual games, more finals and made more grand final appearances than any other club. On 9 March 2007, former Collingwood and Fitzroy defender Gary Pert was appointed the Magpies' CEO, seven weeks after Greg Swann departed for Carlton. In accepting the key Magpie post, Pert quit as a club director and as managing director of Channel 9 in Melbourne. In a press conference, it was stated that Collingwood has budgeted to turn over about $50 million this year. McGuire hopes the new administration will soon double that figure. "A finance administration review has come up with how we are going to turn Collingwood in to its next phase of its life", McGuire said. "What do we do to make ourselves go from a $45 million a year turnover business to a $100 million turnover business? "They sound like big figures but in 1999 we turned over $13 million, so that is where we are heading as a football club." The club made an operating profit of $5.23 million for the 2013 season, revenue increased from $2.6 million to more than $75 million. On 24 July 2017, Pert resigned from his position as CEO of the club, with Peter Murphy replacing him as an interim CEO. The Collingwood guernsey is the most valuable sports sponsorship in Australia. Collingwood has different guernsey sponsors for home and away matches, generating an estimated $6.3 million worth of media exposure for the primary sponsor and $5.7 million for the secondary sponsor. These sponsorships are ranked first and second in Australia. High-profile sponsors include Emirates, Holden, CGU Insurance and Westpac. Collingwood announced its team of the century on 14 June 1997, celebrating 100 years since the beginning of the VFL. Gavin Brown was added as the fourth interchange player in 2002, when the team was named in 1997 only three interchange players were permitted on a team. This list comprises every captain of the club. This list does not include deputy captains filling in due to an injury to the named captain, but does include captains named after a player retires or steps down during the season. There have been twelve presidents of the Collingwood Football Club. The first and founding president of Collingwood was former Collingwood Mayor and Victorian MP William Beazley. Beazley was president of Collingwood from the founding of the club in 1892 until 1911. The second president of Collingwood was Alfred Cross. However, cross was only president for a brief period of time. Third was former Fitzroy and Collingwood player Jim Sharp. Sharp was president for ten years (1913–1923). The fourth president of Collingwood was another former player, Harry Curtis. Curtis currently is the longest serving president of Collingwood. Curtis served as president for twenty six years. Another former player of Collingwood, Syd Coventry was the fifth president for Collingwood, serving twelve years between 1950–1962. Tom Sherrin was the sixth president of Collingwood. Sherrin was president from 1963–1974. Ern Clarke, president for one year, was the seventh president. John Hickey, Ranald MacDonald and Allan MacAlister all served as presidents during 1977 through to 1995. Eleventh president and former player, Kevin Rose, was the second most recent president of Collingwood. The current, twelfth, and second-longest serving president of Collingwood, is radio and television presenter, commentator and journalist Eddie McGuire. McGuire has been president of Collingwood since 1998. The VFL/AFL operated a reserves competition from 1919–1991, and a de facto AFL reserves competition was run by the Victorian State Football League from 1992–1999. Collingwood fielded a reserves team in both of these competitions, allowing players who were not selected for the senior team to play for Collingwood in the lower grade. After the AFL reserves competition was disbanded at the end of 1999, the club fielded its reserves team in the new Victorian Football League during the 2000 season. In 2001, Collingwood reserves team was dissolved and the club entered into an affiliation with the VFL's Williamstown Football Club, such that Williamstown served as a feeder team and reserves players for Collingwood played senior football for Williamstown. Collingwood ended its affiliation with Williamstown after the 2007 season. The reserves team was re-established, and has competed in the VFL since 2008. The reserves team currently splits home games between Olympic Park Oval and Victoria Park, although they do occasionally play at the MCG as a curtain raiser to Collingwood home matches, and uses the AFL team's clash guernsey as its primary guernsey. The Collingwood VFL team is composed of both reserves players from the club's primary and rookie AFL lists, and a separately maintained list of players eligible only for VFL matches. The Collingwood team huddles prior to the inaugural AFL Women's match in February 2017. In April 2016, the club launched a bid to enter a team in the inaugural AFL Women's season in 2017. Meg Hutchins was appointed Women's Football Operations Manager some weeks prior, and given the responsibility of crafting the bid. The club was granted a license in June 2016, becoming one of eight teams to compete in the league's first season. Dandenong Stingrays assistant and Victorian Metro Youth Girls head coach Wayne Siekman was appointed the team's inaugural head coach in July 2016. The team operates its training and administration base within the existing Collingwood home at Olympic Park. Gordon Coventry led the VFL in goal kicking six times. David Williamson's 1977 stage play, The Club, was inspired by the backroom dealings and antics of the Collingwood Football Club; although Collingwood is never mentioned by name. The 1980 film version of the play – directed by Bruce Beresford and starring John Howard, Jack Thompson, Graham Kennedy and Frank Wilson – is set at Collingwood and featured Collingwood players in speaking and non-speaking roles. The film was almost entirely shot on location at Victoria Park, both inside and on the actual oval. Judd Apatow's 2009 film, Funny People, starring Adam Sandler and Seth Rogen, featured a scene with Australian actor Eric Bana trying to explain the rules of Australian rules football. During this scene Bana's character, a St Kilda supporter, voices his dislike for Collingwood while watching a televised game. Adam Elliot's 2009 clay-animated film, Mary and Max, features a scene with a school-yard bully, named Bernie Clifford, who wears a 1970s VFL style Collingwood guernsey. A Collingwood garden gnome can also be seen in the film. In the 2010 independent Australian film Joffa: The Movie, Joffa Corfe and Shane McRae star as a couple of knockabout handymen with a passion for the Collingwood Football Club. John Brack's 1953 painting Three of the Players' depicts three Collingwood players. The players are thought by some to be Lou Richards, Jack Regan and Phonse Kyne. ^ "R.T. Rush Trophy - the runner up - collingwoodfc.com.au". ^ Matt Windley (15 May 2014). "Collingwood, Brisbane Broncos top rankings as Australia's most popular football clubs". Herald Sun. Retrieved 13 June 2014. ^ "Hunt a 'Churchie' goer at best". The Age. Melbourne. ^ "Pies' ashes now in Tigerland". The Age. Melbourne. ^ Mason, Luke (30 August 2012). "Beyond 2000 – Essendon". Collingwood FC. Retrieved 10 June 2017. ^ "Bombers shock Magpies". ABC News (Australian Broadcasting Corporation). 11 August 2006. Retrieved 10 June 2017. ^ "Malthouse parts ways with Pies". ABC News. Australian Associated Press. Retrieved 22 September 2018. ^ "Collingwood has cut six including veterans ruckman Darren Jolly, Alan Didak and Andrew Krakouer". Herald Sun. 1 October 2013. ^ "A new logo, a new chapter". Collingwood FC. 4 October 2017. ^ Eastman, David. "Collingwood Home Jumpers". Retrieved 12 November 2011. ^ McFarlane, Glenn (15 August 2014). "Glenn’s 18 Special Edition: we give you the definitive ranking of the AFL club songs", Herald Sun. Retrieved 27 September 2018. ^ AFL Tunes to Remember – The Age, 23 July 2010. ^ Niall, Jake (29 August 2012). "Ramp up the rivalry". The Sydney Morning Herald. ^ Clark, John (3 August 2012). "As Hawthorn and Geelong write another chapter, we look at five of the AFL's most intense rivalries". ^ Davis, Greg (14 October 2014). "Dayne Beams traded to Brisbane Lions as part of five-way deal". ^ Browne, Ashley (21 October 2014). "Blockbusters and a grudge match set for round one, 2015". ^ Mighty Roar (30 March 2015). "Collingwood Magpies vs Brisbane Lions - Round 22 - 1999 - Last AFL Game At Victoria Park" – via YouTube. ^ Humphrys, Elizabeth. "Beyond a joke: Bogan loathing bring us all to shame". The Drum. ABC. Archived from the original on 3 October 2013. Retrieved 8 October 2013. ^ Cordy, Neil. "AFL AFL DEPARTMENT OF TRADE NAB CUP SHOWS VIDEO GWS Giants supporters are about to learn why footy fans love to hate Collingwood, writes Neil Cordy". ^ Sapienza, Joseph. "Everybody hates Collingwood ... but why?". The Age. Retrieved 8 December 2014. ^ McNamara, Lawrence. "On the Field and Off the Field: Sport and Racial Hatred". HREOC. Australian Human Rights Commission. Archived from the original on 31 December 2014. Retrieved 31 December 2014. ^ Klugman, Matthew. "A game whose time has come: Winmar, Goodes and race in the AFL". The Conversation. Retrieved 14 December 2014. ^ Klugman, Matthew. "AFL: the ugly game of enlightened racism". The Sydney Morning Herald. Retrieved 31 December 2014. ^ Baum, Greg. "No room for smugness in long fight against bigotry". The Age. Retrieved 31 December 2014. ^ "Collingwood Membership Website 2011 | 2011 Membership Home". Membership.collingwoodfc.com.au. Retrieved 22 September 2011. ^ "Club memberships hit 700,000". afl.com.au. Archived from the original on 19 October 2012. Retrieved 2 October 2012. ^ Rielly, Stephen (16 August 2013). "Magpies hit 80,000 members". Collingwoodfc.com.au. BigPond. ^ Muling, Elizabeth (3 September 2014). "Pies surpass membership record". collingwoodfc.com.au. BigPond. ^ "2019 Membership". Collingwood Football Club. ^ Bowen, Nick (25 August 2016). "The membership ladder: Hawks overtake Pies, Dons slide". AFL.com.au. Bigpond. ^ Ralph, Jon (15 August 2017). "Collingwood back on top of the AFL membership ladder". Herald Sun. ^ Waterworth, Ben (2 August 2018). "AFL club membership numbers 2018: Over 1 million members, Richmond surpasses six figures". Fox Sports Australia. Retrieved 29 September 2018. ^ "Collingwood membership tally hits 70,000". Heraldsun.com.au. 13 May 2011. Retrieved 22 September 2011. ^ "Eddie's Letter to Members". Collingwood FC. 13 May 2011. Archived from the original on 16 May 2011. Retrieved 22 September 2011. ^ Brown, Matt (8 October 2003). "AFL denies draw favours Pies – ABC News (Australian Broadcasting Corporation)". Australia: ABC. Retrieved 13 August 2010. ^ "Pies, Blues big winners in AFL draw". Watoday.com.au. 24 October 2008. Archived from the original on 28 October 2008. Retrieved 13 August 2010. ^ Wilson, Caroline (13 May 2009). "Pies a drag on crowd numbers – RFNews". The Age. Melbourne. Retrieved 13 August 2010. ^ "Collingwood AFL club builds build TV studio for digital marketing expansion". 8 January 2014. Archived from the original on 23 September 2015. Retrieved 17 April 2014. ^ a b "Magpies guernsey most valuable". The Age. Australia. 9 March 2011. Retrieved 22 September 2011. ^ "Team of the Century". Collingwood FC. Archived from the original on 21 September 2011. Retrieved 22 September 2011. ^ Gastin, Sam (4 August 2015). "Our twelve Presidents". Collingwood Football Club. Retrieved 27 March 2019. ^ a b "History of the Collingwood Football Club in the VFL". collingwoodfc.com.au. 1 January 2017. ^ "VFL: Season 2008". collingwoodfc.com.au. ^ a b c Allen, Sarah (29 April 2016). "Collingwood launches bid for historic women's AFL team". Collingwood Media. Bigpond. Retrieved 16 October 2016. ^ Allen, Sarah (15 June 2016). "History made: Collingwood women's team announced". Collingwood Media. Bigpond. Retrieved 16 October 2016. ^ Matthews, Bruce (27 July 2016). "Sixteen of the best: women's marquees named". AFL.com.au. Bigpond. Retrieved 16 October 2016. ^ "Draftee defender named top AFLW Magpie". AFL.com.au. Telstra Media. 29 March 2017. ^ Lechucki, Meagan (7 April 2018). "AFLW: Rising Star now a Best and Fairest". Collingwood. Telstra Media. ^ Mullan, Alanna (9 April 2019). "AFLW: Lambert wins best and fairest". Collingwood. Telstra Media. ^ McFarlane, G. & Roberts, M., The Illustrated Collingwood Encyclopedia, 2004; Brown, G., "Collingwood Forever", 1997. ^ "Eric Bana teaches AFL to Seth Rogan". News.ninemsn.com.au. Archived from the original on 13 July 2012. Retrieved 22 September 2011. ^ "Mary, Max and the Magpies". Brisbane Times. Retrieved 22 September 2011. ^ Boland, Michaela (24 August 2010). "Collingwood opts to pass up on painting". The Australian. News Limited. Retrieved 26 May 2016. Victorian Government Hansard of November 1990, pp.2208–2218: Victorian Legislative Assembly's debate on the Collingwood (Victoria Park) Land Bill on 21 November 1990: features an informative interchange between Murray Weideman's older brother, Graeme Weideman, and former South Melbourne footballer, Bill McGrath, both of whom were MLAs at the time. Wikimedia Commons has media related to Collingwood Football Club.